Igbo apex socio-political group, Ohanaeze Ndigbo, has condemned the FG’s call for the re-arrest and bail revocation of IPOB leader Nnamdi Kanu, for allegedly contravening his bail conditions. 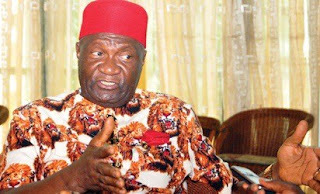 President General of the group, Chief Nnia Nwodo, who gave the statement, also accused the FG of bias, double standard and violation of Kanu’s fundamental human rights especially for refusing to arrest the Arewa Youths whom he said issued threatening and hate speech to Ndigbo. Chief Nwodo also urged the Attorney General of the Federation and Minister of Justice, Abubakar Malami, SAN to “please respect your oath of office,” wondering why the AGF would move to re-arrest Kanu while refusing to do anything to stop the Arewa youths whom he said only ‘pretended’ to withdraw the quit notice they issued to Igbo in the North. Parts of the statement read, “I am amazed that the distinguished attorney is prepared to contest the superiority of the provisions of the constitution on fundamental human rights of freedom of movement and freedom of association over an erroneous judicial proclamation violating those rights. I am equally miffed by the audacity with which the Attorney General displays his bias without regard to his oath of office. Nnamdi, as a citizen of Nigeria, is free to hold any point of view no matter how displeasing to anyone so long as they are not inciting or provoking any criminal activities. I and some Igbo leaders have differences of opinion with Nnamdi on a number of issues. We have been insulted and abused by Radio Biafra but we concede them their right to differ from us.